CHUNG, K. , OH, J. With the widespread distribution of devices with multiple network interfaces, interest in multi-path transmission techniques has increased. The Internet Engineering Task Force (IETF) published Multi-path TCP (MPTCP) as a standard for multi-path transmission techniques and many researchers have studied multipath means of transmitting data efficiently, with each path having different characteristics. However, today's networks have been shown to exhibit high bandwidth-delay product (HBDP) characteristics but MPTCP does not match the requirements of HBDP networks. Many researchers have proposed solutions to overcome this problem, but the solutions have had the drawbacks of ineffective load balancing mechanisms and a trade-off problem between improving throughput and preventing loss events. In this paper, we propose an efficient MPTCP-based congestion control scheme in HBDP networks. Our scheme consists of two main mechanisms. One is to mitigate trade-off problems observed in previous works and the other is to enhance traffic migration according to the conditions of each path. Simulation results have shown that our scheme achieves those goals and enhance performance in HBDP networks. R. Stewart, "Stream control transmission protocol," IETF RFC 4960, Sept. 2007. J. Iyengar, P. D. Amer, and R. Stewart, "Concurrent multipath transfer using SCTP multi-homing over independent end-to-end paths," IEEE/ACM Trans. Netw., vol. 14, no. 5, pp. 951-964, Oct. 2006. P. Vo, T. Le, S. Lee, C. Hong, B. Kim, and H. Song, "mReno: A Practical Multipath Congestion Control for Communication Networks," Computing, vol. 96, no. 3, pp. 189-205, Mar. 2014. 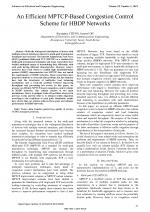 A. Ford, C. Raiciu, M. Handley, and O. Bonaventure, "TCP extensions for multipath operation with multiple addresses," IETF RFC 6824, Jan. 2013. M. Honda, Y. Nishida, L. Eggert, P. Sarolahti, and H. Tokuda, "Multi-path congestion control for shared bottleneck," Proc. 7th PFLDNet Workshop, 2009. C. Raiciu, M. Handley, and D. Wischik, "Coupled congestion control for multi-path transport protocols," IETF RFC 6356, Oct. 2011. D. Wischik, C. Raiciu, A. Greenhalgh, M. Handley, "Design, implementation and evaluation of congestion control for multi-path TCP," Proc. 8th USENIX NSDI Conf., vol.11, pp.8-22, Mar. 2011. J. Zhao, C. Xu, J. Guan, H. Zhang, "A fluid model of multipath TCP algorithm: Fairness design with congestion balancing," Proc. IEEE Int. Conf. on Commun., London, 2015, pp. 6965-6970. C. Xu, J. Zhao, G. Muntean, "Congestion Control Design for Multipath Transport Protocols: A Survey," IEEE Commun. Surveys & Tutorials, vol. 18, no. 4, pp. 2948-2969, Apr. 2016. R. Gonzalez, J. Pradilla, M. Esteve, C. E. Palau, "Hybrid delay-based congestion control for multipath TCP," Proc. IEEE Mediterranean Electrotechnical Conf., Limassol, 2016, pp. 1-6. T. Le, C. Hong, and S. Lee, "Multi-path binomial congestion control algorithms," IEICE Trans. Commun., vol. E95-B, no. 6, pp. 1934-1943, Jun. 2012. T. Le, C. Hong, and S. Lee, "MPCubic: an extended Cubic TCP for multiple paths over high bandwidth-delay networks," Proc. Int. Conf. on ICT Convergence, Seoul, 2011, pp. 34-39. B. P. Ha, B. Y. Tran, T. A. Le, C. H. Tran, "A hybrid multi-path congestion control algorithm for high speed and/or long delay networks," Proc. 2014 Advanced Tech. Commun., Hanoi, 2014, pp. 452-456. S. Ferlin, O. Alay, T. Dreibholz, D. A. Hayes , M. Welzl, "Revisiting congestion control for multipath TCP with shared bottleneck detection," Proc. IEEE INFOCOM, San Francisco, 2016, pp. 1-9. R. Khalili, N. Gast, M. Popovic, U. Upadhyay, J.-Y. Le Boudec, "MPTCP is not pareto-optimal: performance issues and a possible solution," Proc. 8th Int. Conf. on Emerging Netw. Experiments and Technologies, Nice, 2012, pp. 1-12. Q. Peng, A. Walid, J. Hwang, S. Low, "Multipath TCP: analysis, design, and implementation," IEEE/ACM Trans. Netw., vol. 24, no. 1, pp. 596-609, Feb. 2015. Y. Cao, M. Xu, X. Fu, "Delay-based congestion control for Multipath TCP," Proc. 20th IEEE Int. Conf. on Network Protocols, Austin, 2012, pp. 1-10. S. Ha, I. Rhee, and L. Xu, "CUBIC: a new TCP-friendly high-speed TCP variant," ACM SIGOPS Operating System Review, vol. 42, no. 5, pp. 64-74, Jul. 2008. V. Konda and J. Kaur, "RAPID: shrinking the congestion control timescale," Proc. IEEE INFOCOM, Rio de Janeiro, 2009, pp. 1-9. J. Gettys and K. Nichols, "Bufferbloat: dark buffers in the Internet," Commun. ACM, vol. 55, no. 1, pp. 57-65, Jan. 2012. L. S. Brakmo, S. W. OMalley, and L. L. Peterson, "TCP Vegas: new techniques for congestion detection and avoidance," Proc. ACM SIGCOMM Symposium, vol. 24, no. 4, pp. 24-35, Oct. 1994. H. Jung, S. Kim, and S. Kang, "Adaptive delay-based congestion control for high bandwidth-delay product networks," Proc. IEEE INFOCOM, Shanghai, 2011, pp. 2885-2893. S. Floyd, M. Handley, and J. Padhye, "A comparison of equalion-based and AIMD congestion control," AT&T Center for Internet Research, 2000. L. Xu, K. Harfoush and I. Rhee, "Binary increase congestion control (BIC) for fast long-distance networks," Proc. IEEE INFOCOM, vol. 4, pp.2514-2524, Mar. 2004. D. Chiu and R. Jain, "Analysis of the increase and decrease algorithms for congestion avoidance in computer networks,"Comput. Netw., ISDN Syst., vol. 17, no. 1, pp. 1-14, Jun. 1989. Citations for references updated on 2019-04-22 13:11 in 118 seconds.